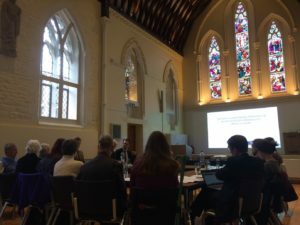 On the 16th and 17th February the MALMECC team welcomed an international gathering of medievalists to Oxford for a workshop focused on ecclesiastical courts as places of cultural production, performance, reception and dissemination. The team hoped that assembling scholars of many different disciplines (including historians, musicologists, art historians and literary scholars) would both illuminate this important but understudied social milieu or setting, and facilitate future theorization. Proceedings began in the suitably magnificent St Luke’s Chapel—sadly only neo-Gothic—with words of welcome from Prof. Karl Kügle, in which he laid out some of the questions that had been asked of invited participants and which were open for discussion: how should we define the ecclesiastical court? Beyond the households of (prince-) bishops and cardinals, could one perhaps include cathedral or collegiate church chapters? What about noble monastic houses such as the royal abbey of Las Huelgas or the Frauenstift at Essen? What, if anything, distinguished the ecclesiastical court from a secular one? The first paper was given by Prof. Dr. Werner Paravicini. Taking as his subject matter the Teutonic Order, Herr Paravicini traced the developing differentiation between the knights and the Grand Master of the Order, the increasingly blatant retention of aristocratic practices that knights had supposedly given up on entry, with secular titles mentioned in the administrative documents of the order from the 1370s, and worldly rank becoming increasingly important for one’s treatment in the order. A far cry, then, from the ‘background-blind’ beginnings of the knighthood where officers were elected and personal property anathema. There was also a clear falling-off in religious observance, or, if knights were in chapel, there are accounts of brothers sitting in the stalls with hawks on their wrist. Next, Prof. Kügle read a paper on the court as heaven, and heaven as a kind of court, examining parallels in the importance of performance and proximity between religious and secular hierarchies. The generation of distinction, to use Bourdieu’s phrase, became a central goal of courtly life, often taking the form of the invention of new traditions (think of the knightly orders founded by so many dynasties in imitation of the Garter), while the overwhelming important of closeness to the source of power was common to both types of court. 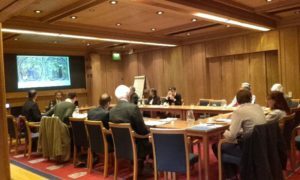 The second day of the workshop, when the participants met in the Margaret Thatcher Centre at Somerville College, began with a paper by Prof. Dr. Andreas Bihrer. Regrettably, Prof. Bihrer was unable to join us in person, but had very kindly allowed his paper to be circulated and discussed in his absence. 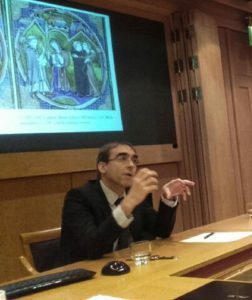 Taking as his point of departure the Oxonian Walter Map and his De nugis curialium, his contribution was a stimulating and wide-ranging discussion of the episcopal court. Proposing a wide-ranging approach to the court as the ‘bishop’s milieu in its entirety’, including even the cathedral chapter, Bihrer suggested that ecclesiastical courts were more stable and office holders rather more independent than their secular homologues. This discussion was continued among the participants in Oxford, who wondered how the differentiation between entourage or familia and institution could be negotiated. Paired with Prof. Bihrer—whose PhD was a study of the court of the Bishops of Konstanz in the early fourteenth century—was Dr David Murray, whose paper looked at the court of Pilgrim II of Salzburg. Focusing on the adoption of influences from Prague (the Schöne Madonnen statues) and from France (in the shape of the melody of a three-part canon re-used by the Monk of Salzburg), he asked how cultural pursuits could be used in the elaboration of a shared identity among courtiers and, indeed, in the bishopric at large. After coffee, Dr Laura Slater offered a paper which opened up discussion of the place of women at ecclesiastical courts, not only as visitors (including the example of Philippa of Hainault’s chilly reception on a visit to her husband at Durham), but also as valuable connections to secular power structures, for example as abbesses of reichsunmittelbare abbeys. Similarly, in secular courts, women (especially queens) were often responsible for the fostering of relationships to religious houses and, in cases such as that of St. Margaret of Scotland or St. Elizabeth of Thuringia, introducing an air of holiness to the court. In the afternoon, attention was turned to Avignon as Prof. Étienne Anheim and Dr Christophe Masson drew the spotlight respectively to the Papal court and the cardinals’ livrées. First Prof. Anheim gave an illuminating account of the curia as a polycentric court which ‘produced’ government and the place from which the representation of power was done. It was, he suggested, the hieratic environment that encouraged and facilitated the development of the courtly model later exported around Europe. Dr Masson’s paper investigated the practical, methodological and also conceptual problems of studying the cardinals at Avignon, offering a view of the popes as super-cardinals, not cardinals as mini-popes as is more common in scholarship. The participants also discussed the problems of identifying in the records those responsible for liturgical singing, and the differentiation of cappellani from cappellani cappellae, as well as the evidence for competition between cardinals to host the most sumptuous entertainments. In the final discussions, participants returned to the question of the relationship between household and court, seeing the one as the centre of the other, larger organism. It was also suggested that an administrative or judicial approach could be fruitful as a means of identifying courtiers as those subject to legal protections or exemptions from taxations. Rich food for thought, indeed. 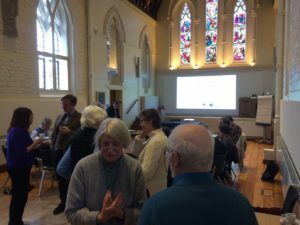 The workshop was undoubtedly a great success, and laid the foundations for important future conversations among the participants, opening up new lines of enquiry for all involved. We were particularly grateful to our international visitors, Prof. Dr. Paravicini and Prof. Anheim, for their valuable contributions and participation. Special thanks are also due to both the project administrator Martha Buckley for all her organizational and logistical help, and to John Merrington of Somerville who assured the smooth running of proceedings on Saturday.